From the Shadows: T. Lynne Tolles Books + Swag Giveaway Winner! T. Lynne Tolles Books + Swag Giveaway Winner! Congratulations to Marjie Pride of A Reelfoot Hoodrat's Thoughts our T. Lynne Tolles Books and Swag Giveaway winner! Marjie will receive *signed* copies of Blood of a Werewolf and Blood Moon by T. Lynne Tolles, a set of six trading cards featuring cover art from Blood of a Werewolf , Blood Moon , Blood Lust , Bloodstone Heart , Deadman's Blood, and Somber Island , and six fabulous bookmarks. Enter the YA Paranormal Book Giveaway to win Spirit Storm by E.J. Stevens, The Iron Queen by Julie Kagawa, and Demonglass by Rachel Hawkins (ends 6/21). US only. Ending soon! Enter The Brookehaven Vampires Bookmark Giveaway for a chance to win one of 3 bookmarks (ends 6/24). US + Canada. Enter the Kiss of a Silver Wolf Ebook Giveaway to win an ebook copy of Kiss of a Silver Wolf by Sharon Buchbinder (ends/ 6/30). International. OMG thank you so much! 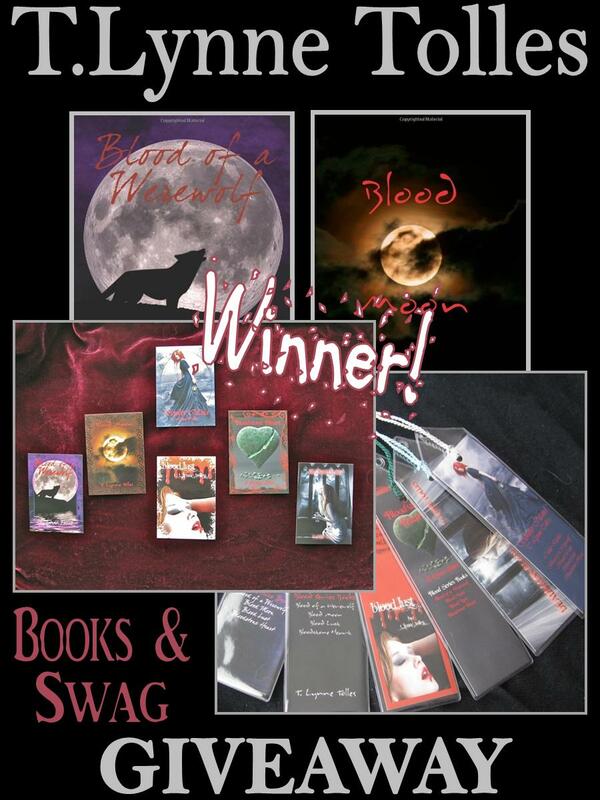 Brookehaven Vampires Bookmark Giveaway Winners! YA Paranormal Book Giveaway Winner!